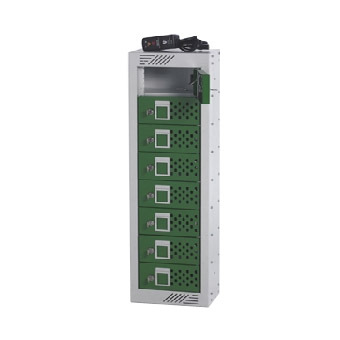 This 8 compartment charging locker provides a great way to securely store your employee's smartphones during the day whilst also offering a convenient charging function. Staff members will be safe in the knowledge that their valuable mobile phones will be secure and will also benefit from a fully charged battery when they collect the device. Each storage compartment has its own lock and individual electrical socket that the user can plug a charging lead into. Made with Biocote protected steel that reduces the level of harmful bacteria on contact surfaces by up to 99.9%.